Don’t push the river, it flows by itself. 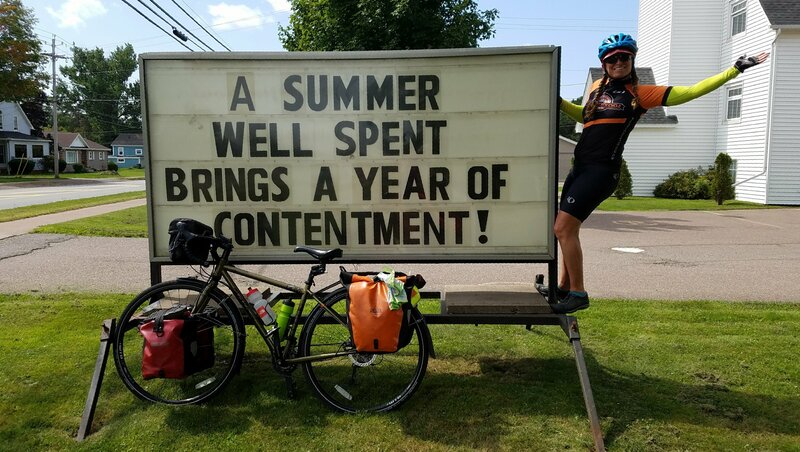 Keep pedaling. 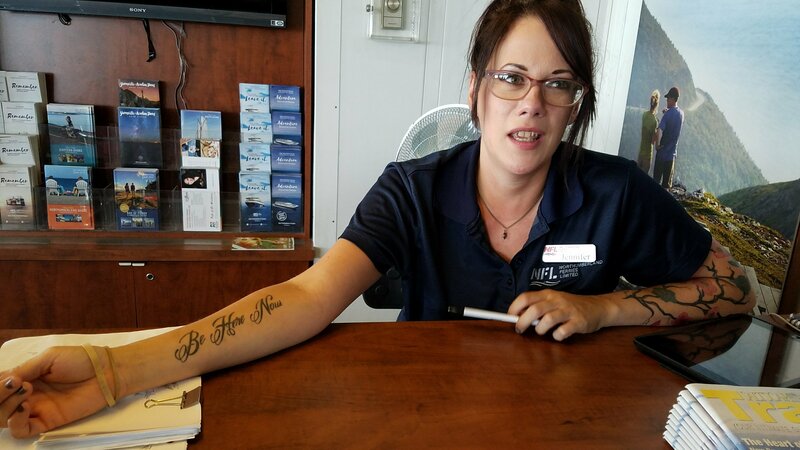 Ride on, write on, right on. In fact, since our independent returns to Seattle, Olive and Glory have never been far from. 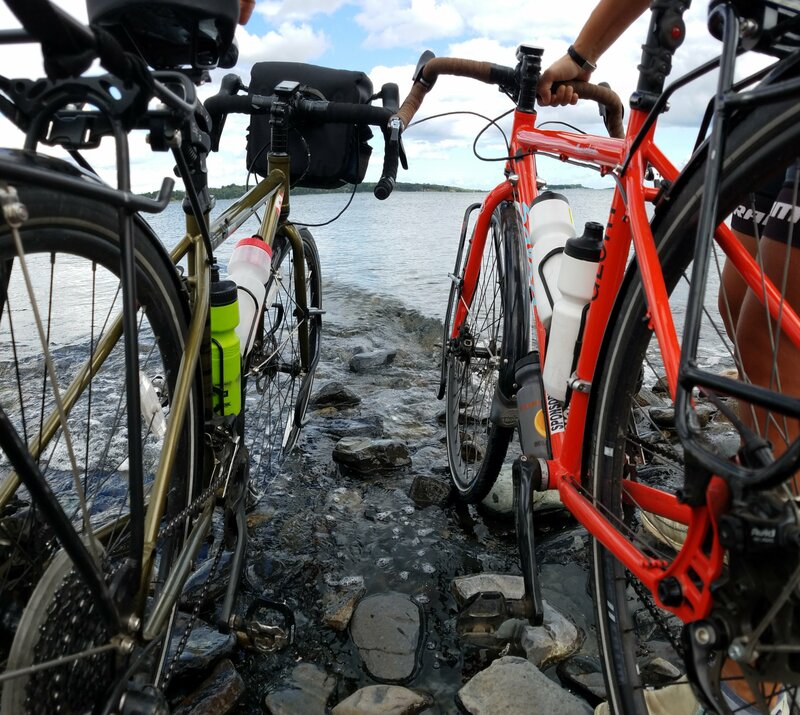 We both have the luxury to ride regularly, and have been blessed this fall and winter with unseasonably drier than most days. I continue to commute, park Olive behind my desk and great students at the door next to a poster of me wearing wings from a public art piece along the Route Verte in Montreal. 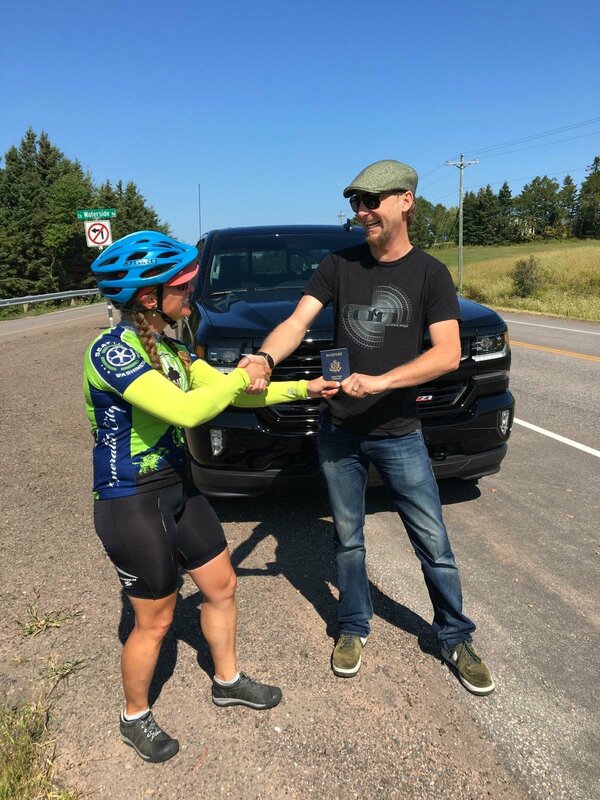 Irena increased her bike commuting, taking Glory the long way to cross the lake until last week. 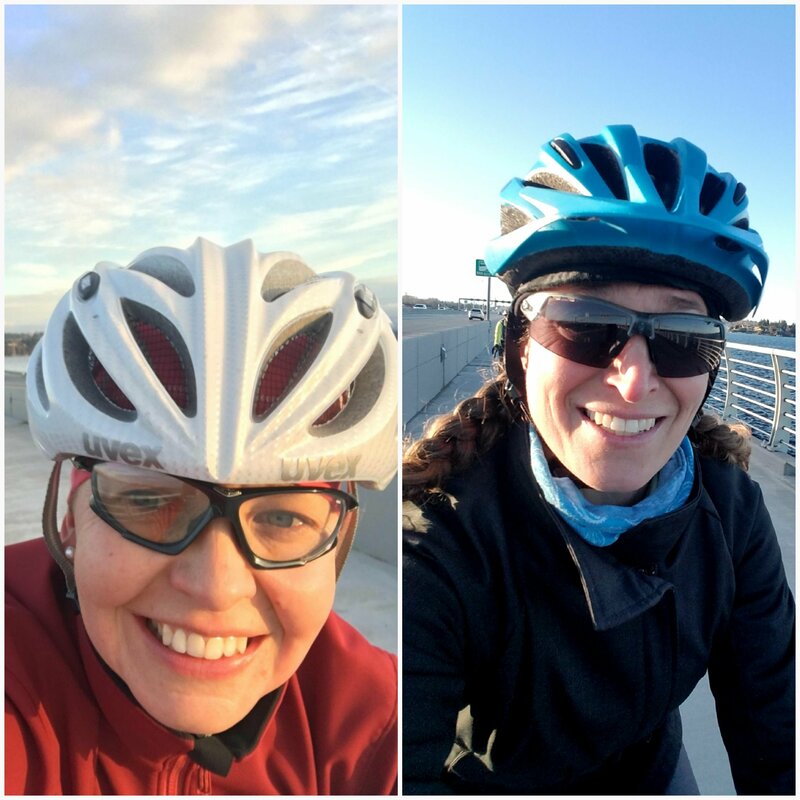 Last week our region opened a much overdue, new 14′ wide bike lane on the north side of the state route 520 bridge, ultimately shortening and easing her daily commute! I rode in the sunshine on the opening day and texted Irena a photo. She rode it the next day, to work, and texted me back. 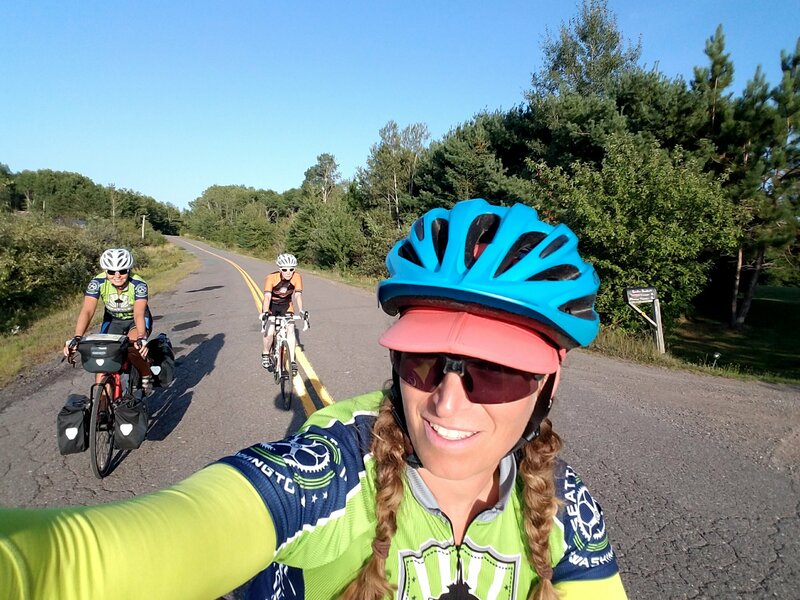 So here we are, Olive and Glory, Irena and Jess, all smiles, riding a new path, at long last! Thank you all for following along, riding along, encouraging us, hosting us, entertaining us, feeding us, inspiring us, supporting us, and celebrating with us. 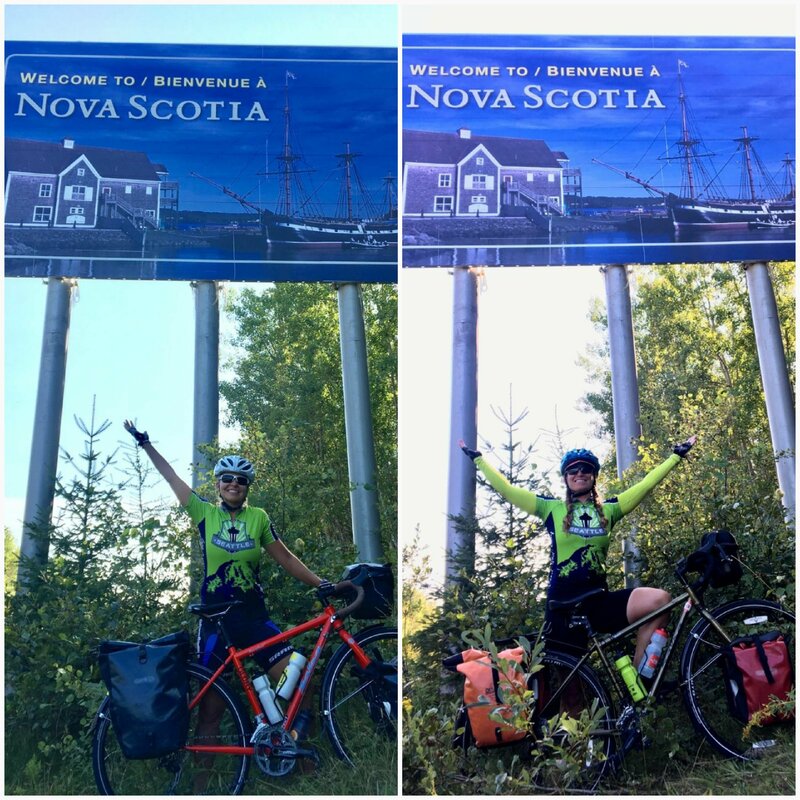 Shortly after my rockstar ride partner Irena rolled away from the hostel in Halifax I loaded up and rode to cyclesmith bike shop. I had called a week earlier to set up the boxing day and was instructed to be the first one in the shop at 11. At 10:45 I watched all the employees check in the back door before they held the front door open for me at 11. Sue planned to meet me there. Sue lives on Cape Breton and offered to visit and assist with my departure from Nova Scotia since her parents and childhood town is near the airport. I met Sue three summers ago when she served s the awesome adult chaperone for the arctic Girl Guides trip I lead. 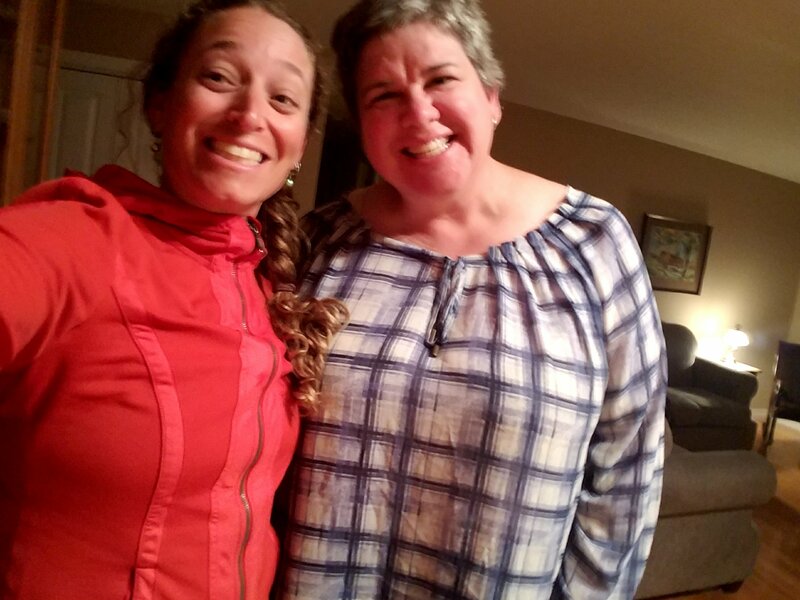 It was swell to catch up with her and her husband Basil for a lovely lunch, a needed nap, and then a special dinner of homemade seafood chowder, fresh salad (with maple vinaigrette), and oat cakes with ice cream. 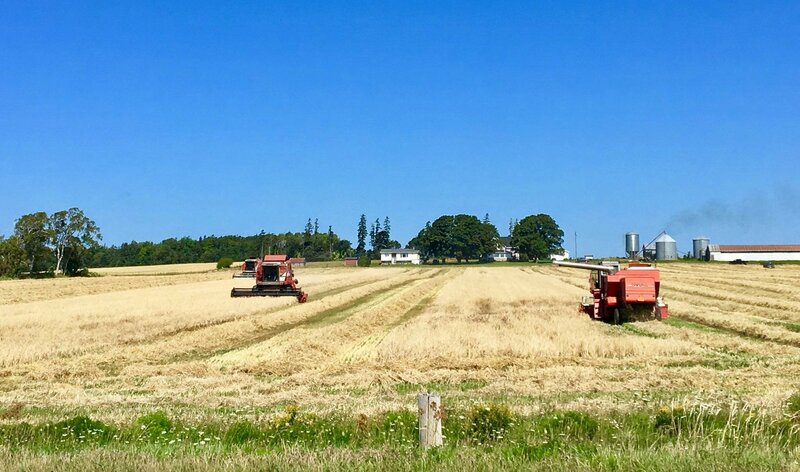 Oat cakes started appearing on the menu at Timmy’s in New Brunswick, and Irena and I had some there and from the bakery in Tatamagouche, Nova Scotia. These Sue offered, with vanilla ice cream, were delicious. She explained that 50 years ago, every home in Nova Scotia made them and it was always on offer with tea or coffee when visitors came by. A local treat. 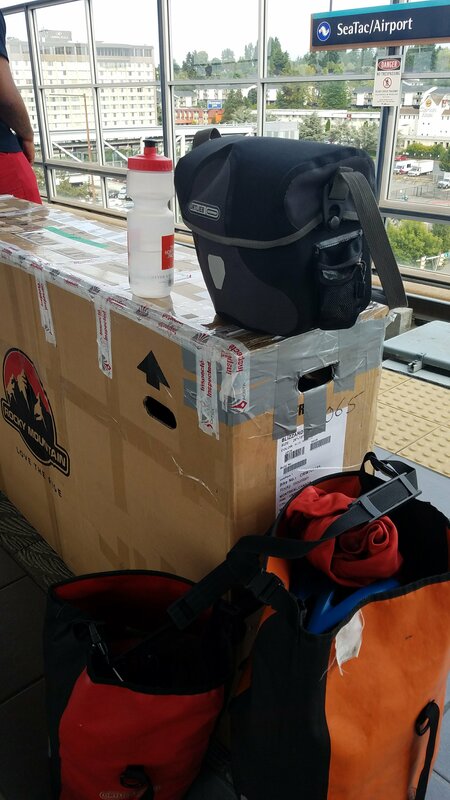 Very early Monday morning, we wrapped my bike box in a tarp, secured it in the bed of the truck, and drove to the airport, runway lights bright in the dark. 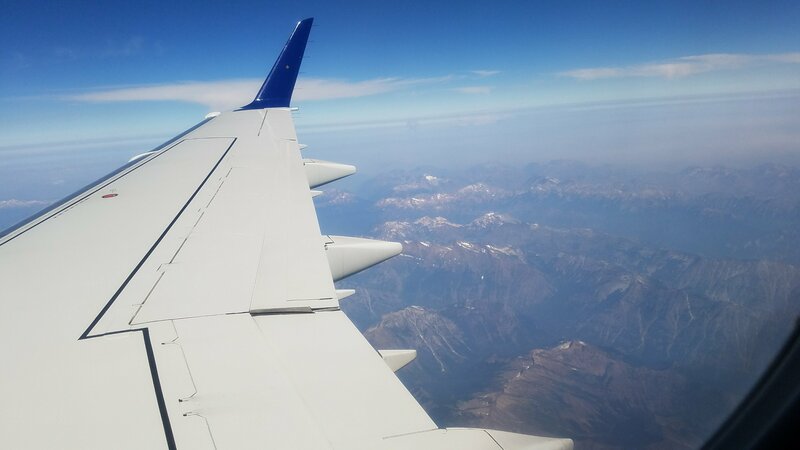 And then, by the miracle of flight, what had taken me 71 days to cross, zipped backward under my wing. 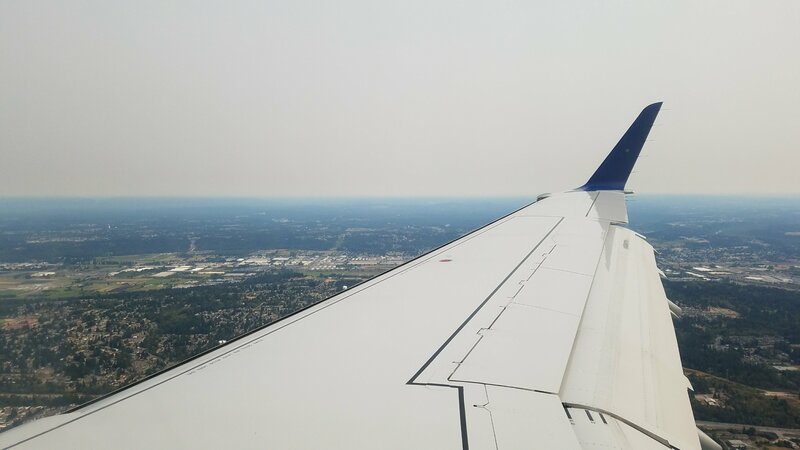 A stop in Calagary, and then on to my emerald city, cloaked in a smoky haze from nearby fires. The west was hot and dry this summer and it was a shock. 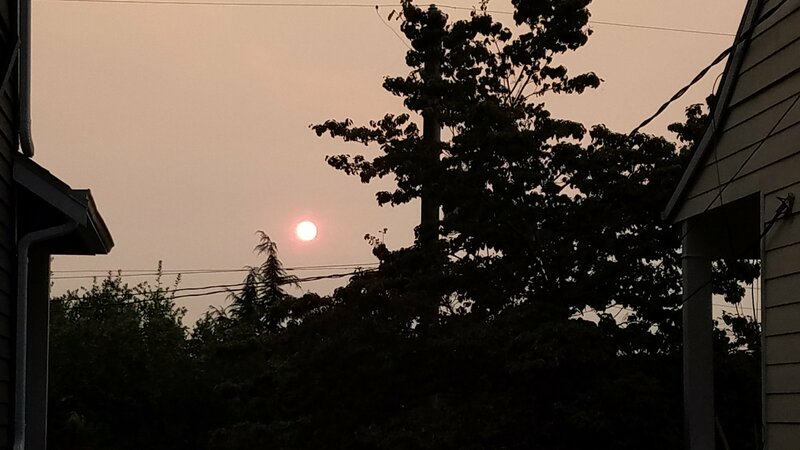 Seattle will be 34 °C Tuesday. The kindness of strangers to bike travelers continued in town as some fellow Seattlites helped me to light rail on both ends. 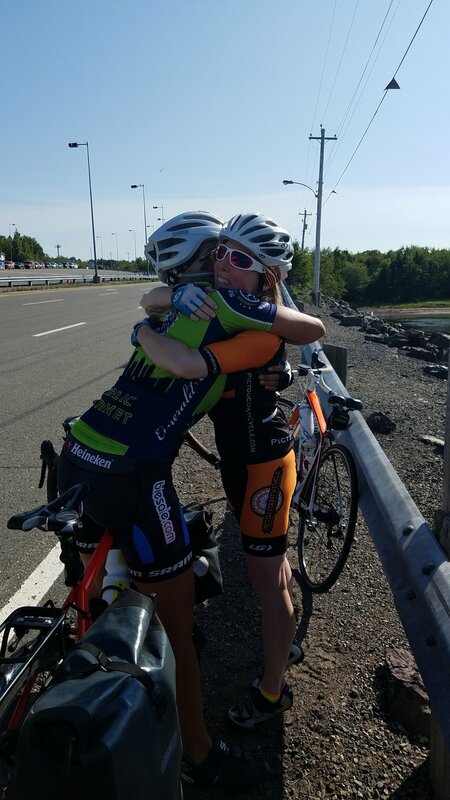 I met my neighbor/friend at my station for the last leg home. 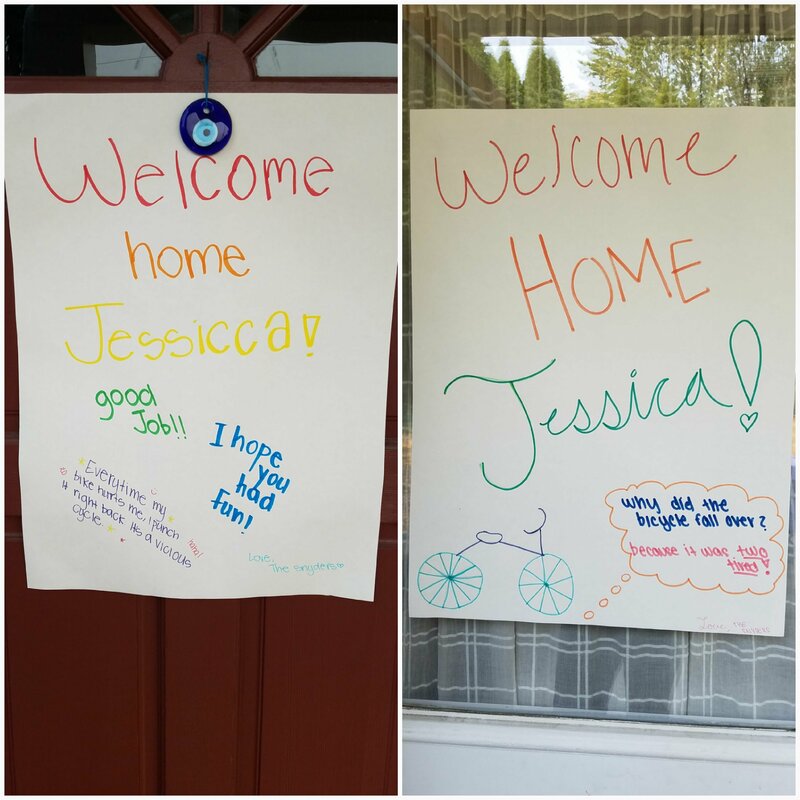 His girls made me welcome signs for both my doors. The sun burned red. I climbed into my bed as the moon glowed red. 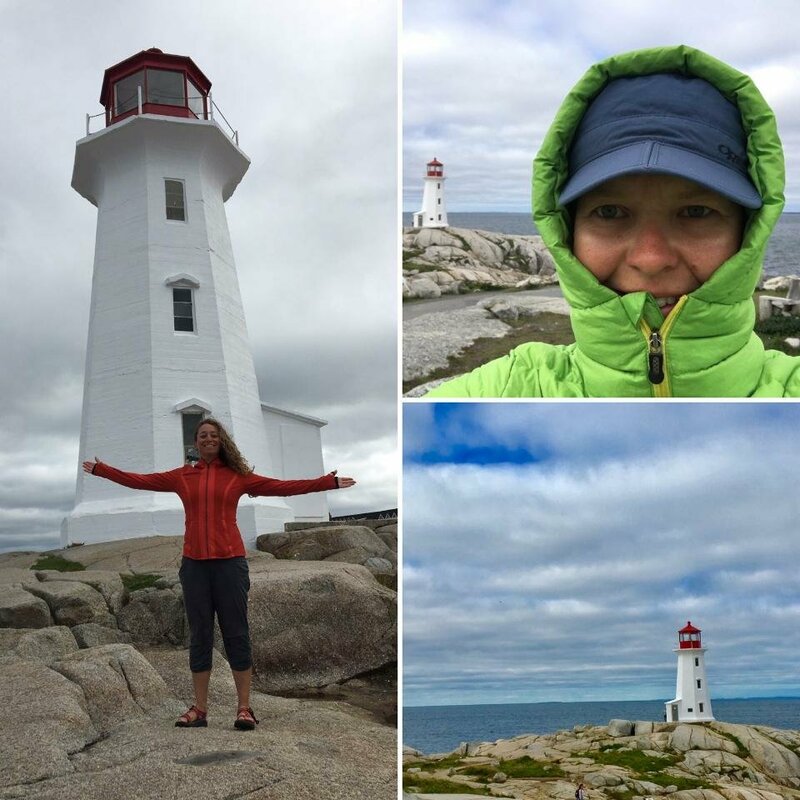 This gem of a lighthouse is one of the most photographed places in Canada. Rightly so. 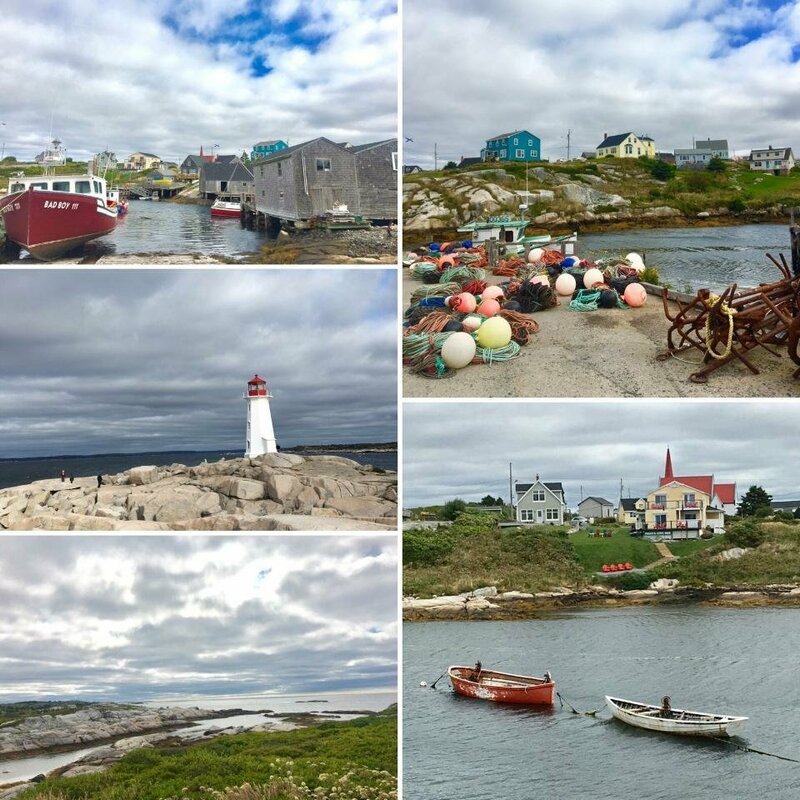 The ancient granite rocks and small fishing hamlet, totally rocked, and reminded me of Henningsvaer, Norway, also on the tip of the Atlantic. The wind whipped, and the clouds danced back and forth, teasing us. It was cold, as you can see from Irena’s selfie. We continued down the coast another 90 km or so in a little rented car (gasp!) 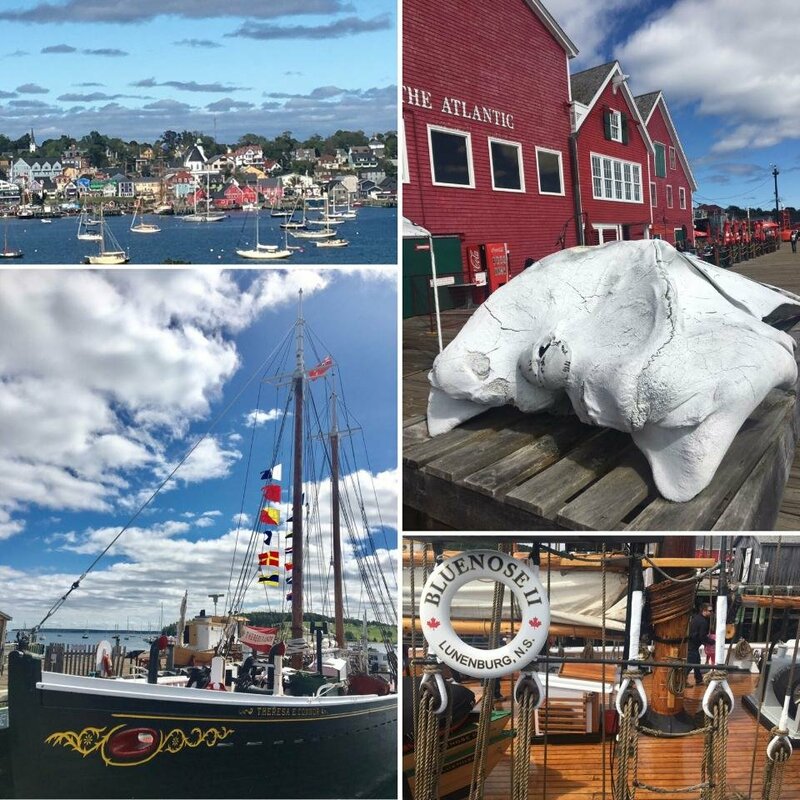 to Lunenburg, one of only three urban UNESCO sites in North America. We were charmed by the colorful buildings, tall ships, and maritime culture. The Blue Nose II, Nova Scotia’s sailing ambassador, sat in port and then later set sail with a group of tourists, with the 1100 square foot main sail impressing this salty gal, and the mast of the schooner from BC impressing the other. Of course, we had our last lobster rolls for lunch at the Salt Shaker Deli. By later afternoon we drove out to the point, Blue Rocks, for ice cream out of this tiny general store. It was a delight to sit in the sun, listen to the surf, smell the salt, and just relax a bit. I took a number of photos with the Nikon so stay tuned. We returned to town winding through the South End, “the nice part of town”, and past Dallhousie University. We wandered the boardwalk one last time, gawking at the huge German cruise ship (11 decks) that nearly turned on a dime near McNab Island and headed out toward NYC. 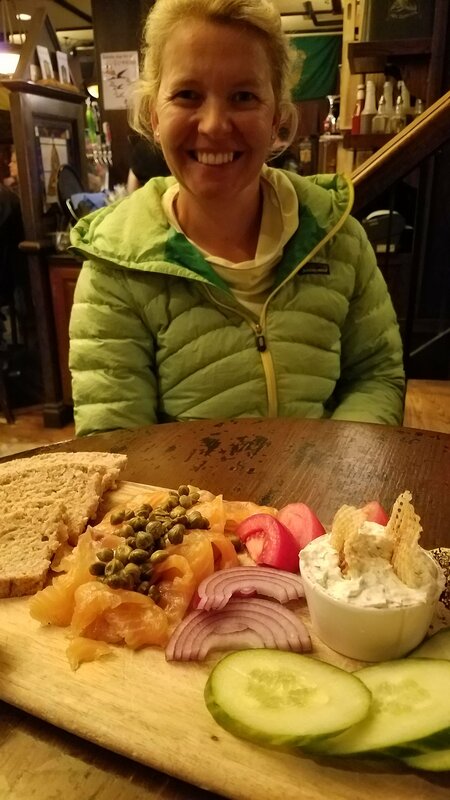 We strolled to The Old Triangle, a Nova Scotia Irish pub for music and delishes fishes dishes, including this gravlax board. 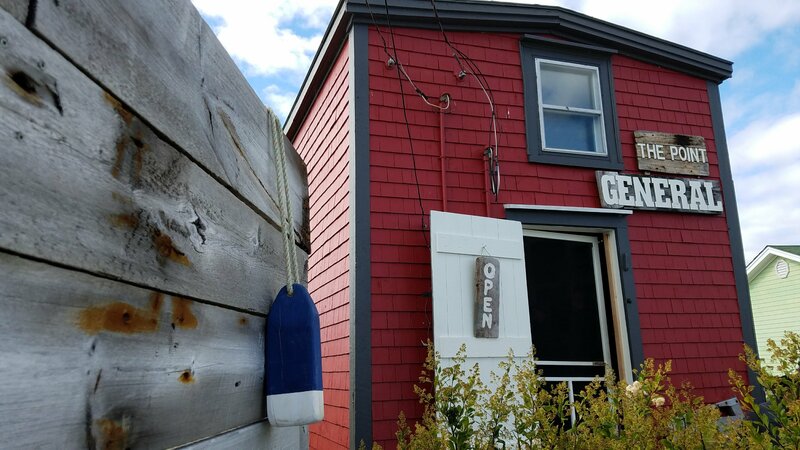 Irena had the fish and chips, and I had the Newfoundland Salt Cod Cakes. On the back of a kids menu we scribbled some notes–highlights of the adventure, a top ten list, and catch phrases for each province. 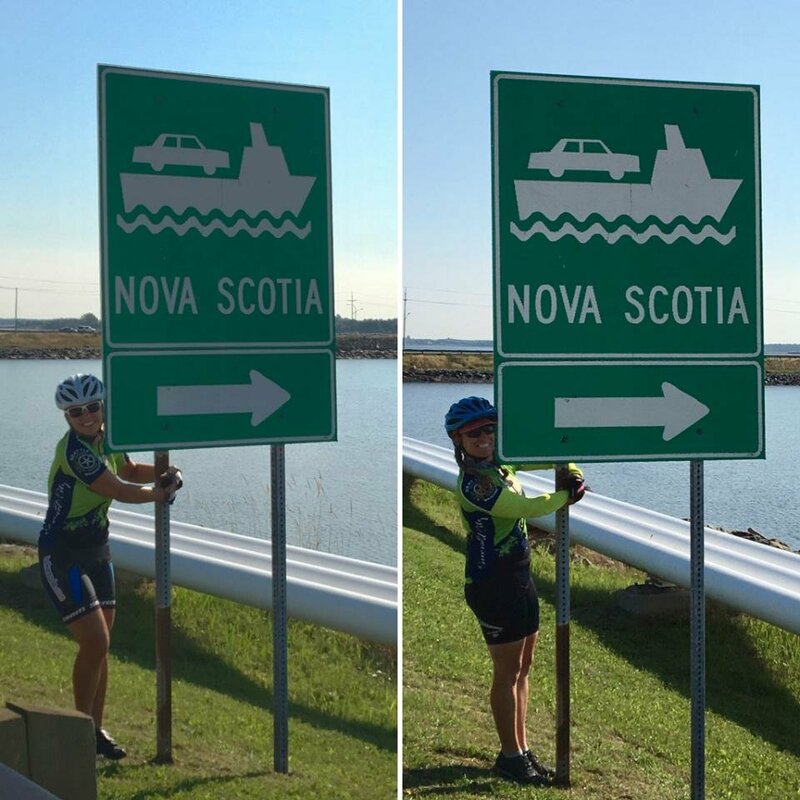 Nova Scotia=Fish and Ships. 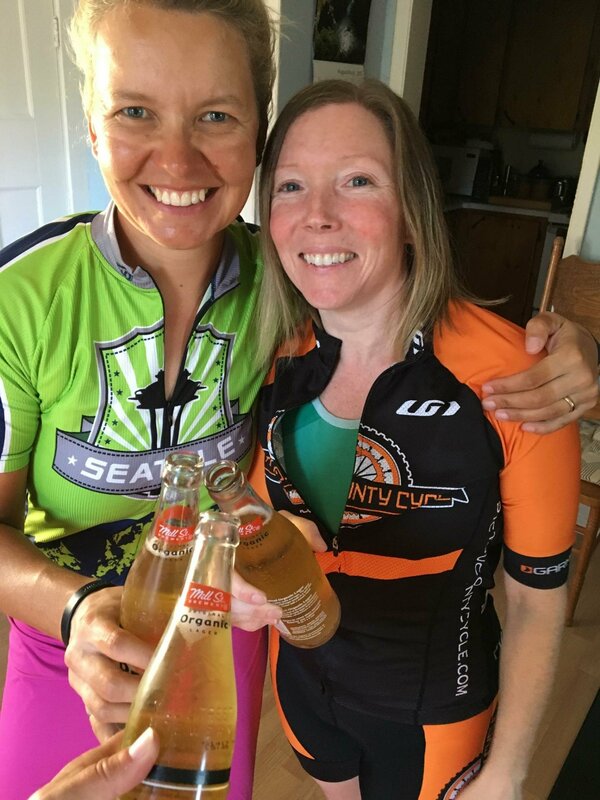 With a final radler we toasted each other, this accomplishment, and the continued safe travels for the next part of the stories. Remember, Irena continues on from Halifax to St. John’s Newfoundland. One more province, and another time zone. Follow along. It’s funny that the two families who helped with today’s celebratory photos were from Vancouver. So close, and yet so far. One group asked us what our hardest part of the journey was. It’s a natural question. True. But we wish not to dwell, or recount, those parts. Rather, it’s the joys, and the highlights; we savor the gems along the way, the colors, the smells, the slant of light, and the people. Each thread, each tale, each photograph, we’ve woven into the tapestry of this remarkable landscape, this adventure. 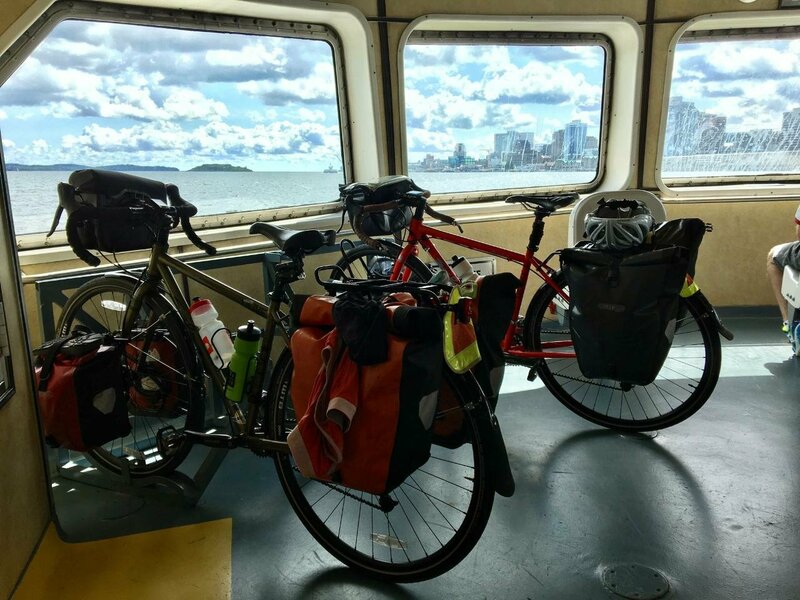 Today we arrived in Halifax, Nova Scotia, via the cute little doughnut shaped ferry from Dartmouth. Today we dipped the front wheels in the Atlantic Ocean. Today we stood together in awe and admiration. 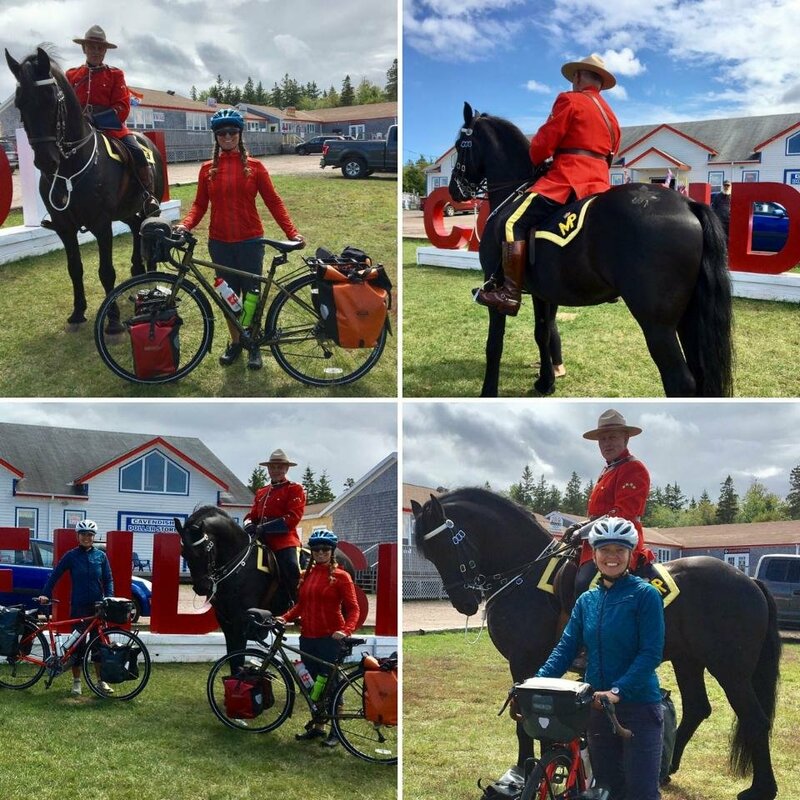 Today, I finished my journey of thousands, and thousands, of kilometers across nine provinces of Canada! Part III of this journey is nearly done. 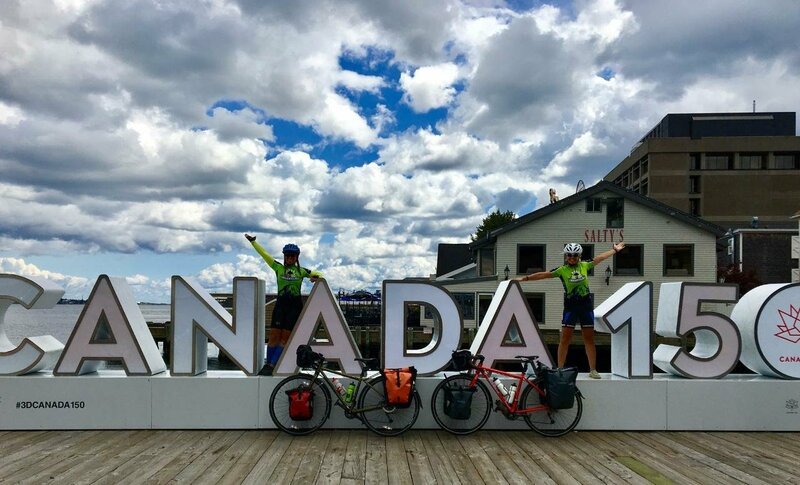 We will enjoy some sites together, before Irena continues solo to St. John’s, Newfoundland, in part IV of this adventure. 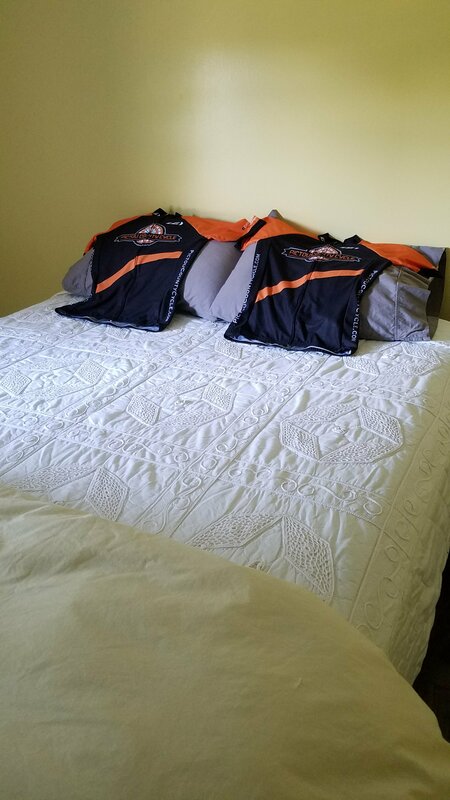 The day started in our new team jerseys (Thanks Alanna!) 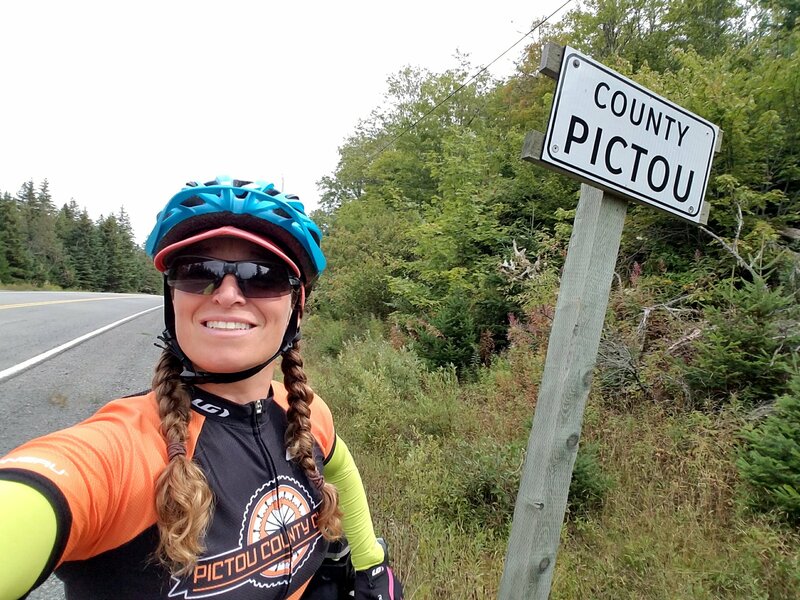 as we road out of Pictou County. In the middle we met some other bikers, boys on their way home from a friend’s house and then a couple doing hill laps on the red pavement. 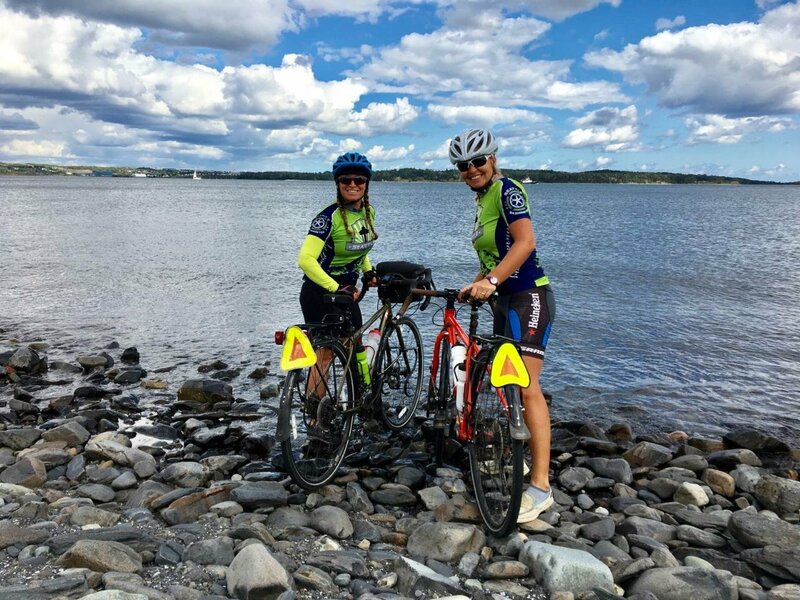 And then we hit the REAL middle, half way between the North pole and the equator, 45°N Latitude, in Stewiacke. 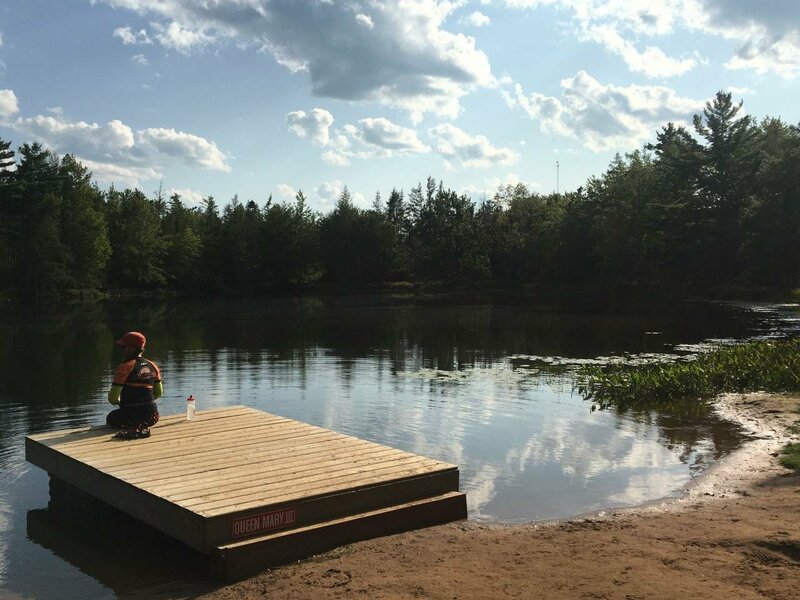 At the end, after I double-fisted a thirst quenching Orange Julius and a blizzard, I swam in little Lake Lynch. 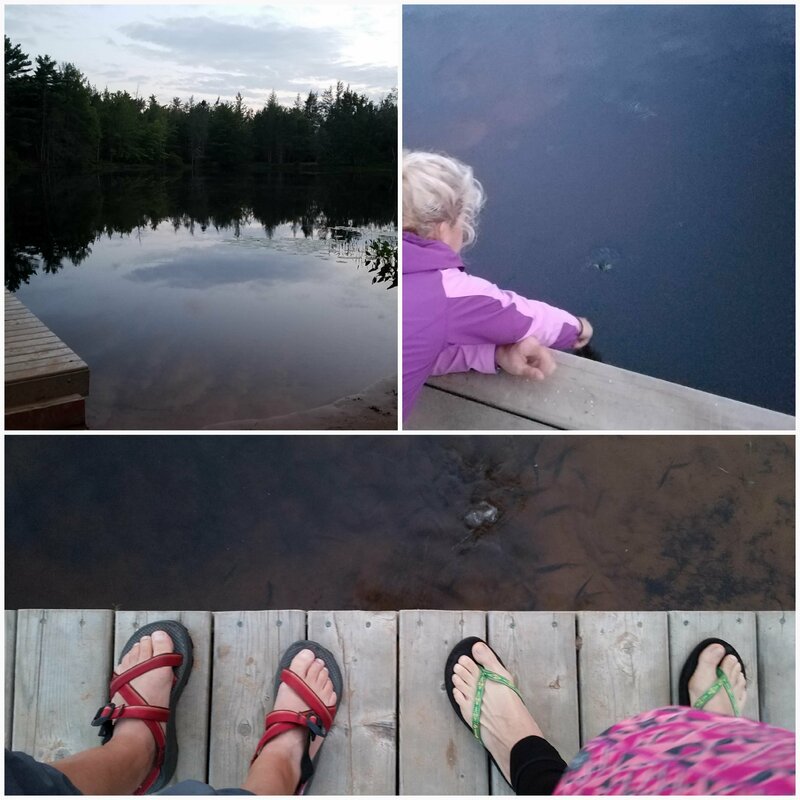 Later we fed fish and painted box turtles, the white bread sucked under by the wild, the moonlight reflection remained floating above. 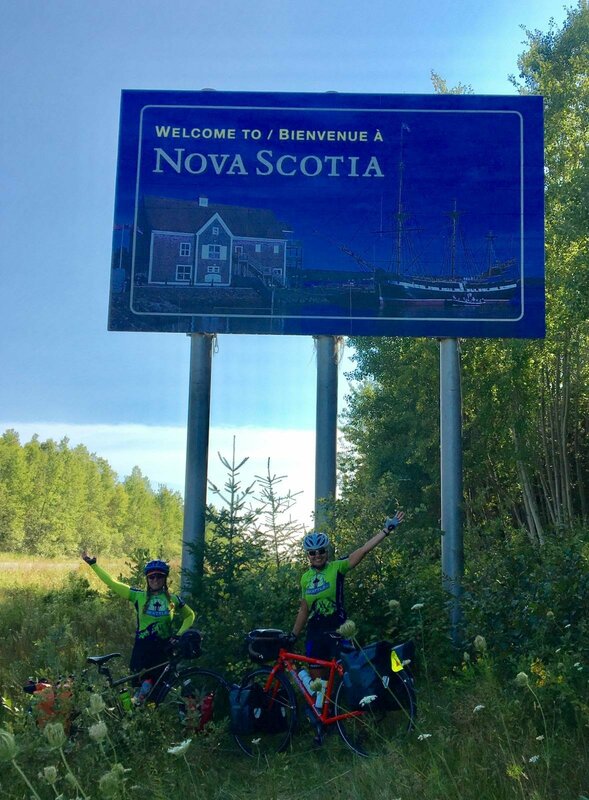 We are in the local Nova Scotia news! The young adventure to Churchill Manitoba three summers ago. 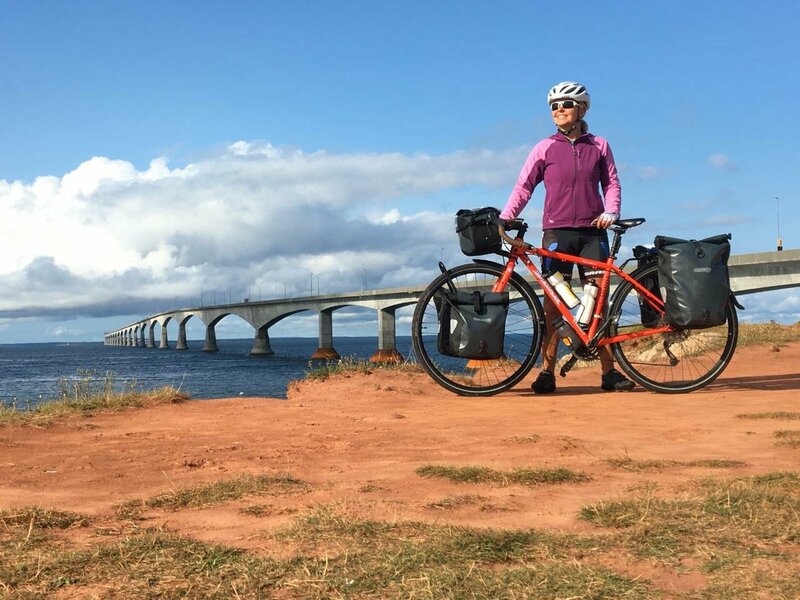 We met up with her last weekend and this is her article about our cross country bike adventure. The breakfast table of the Charlottetown hostel was full of travelers, passing the jam, or the fresh banana bread. We told of our journey briefly, listened to others, then pulled our final things out of our nautically decorated private room of the hostel. She was our first angel of the day. We were trying to make the 2:45 ferry to Nova Scotia. It was going to be closer now than we’d planned. At 1:15, I put my legs to the test, and sang that good ole Salt N Pepper song, “push it real good”, as I went a serious push pace for more than an hour. Thankfully the road no longer climbed, and instead rolled slightly downhill to the water. Regardless, the race pace was on. I was relentless in the push. When I pulled into the toll both, I visualized a red ribbon, and raised my first with power pump. Made it! There was Irena, already having purchased the tickets, and stalling by talking with the attendant about how her friend was on the way. I felt a rush of immense joy. 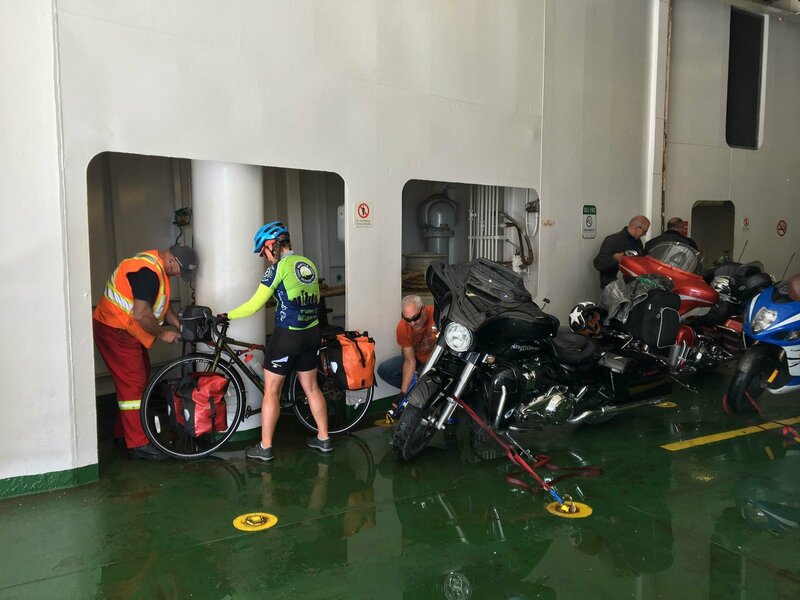 In line behind the motorbikes, we pulled onto the huge ship, and the motorcycle guys all knew what to do, fetching the ratchet straps and hooking them to their bikes and the D rings in the floor of the vessel. 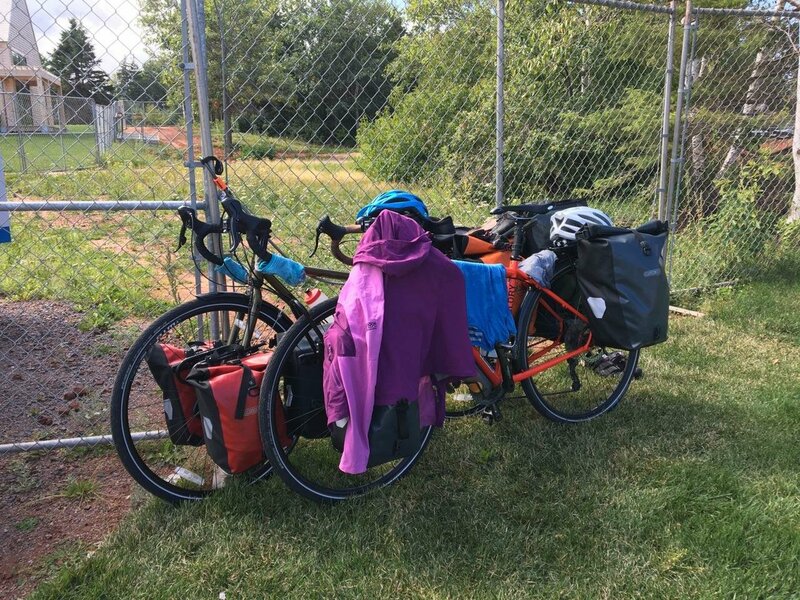 Irena and I wondered what to do with our bikes and got a bit of assistance, either to stash it in a corner or secure it with similar straps to a pole. Beautiful crossing with a lovely snack, but took less time than we thought. I could have used more rest. 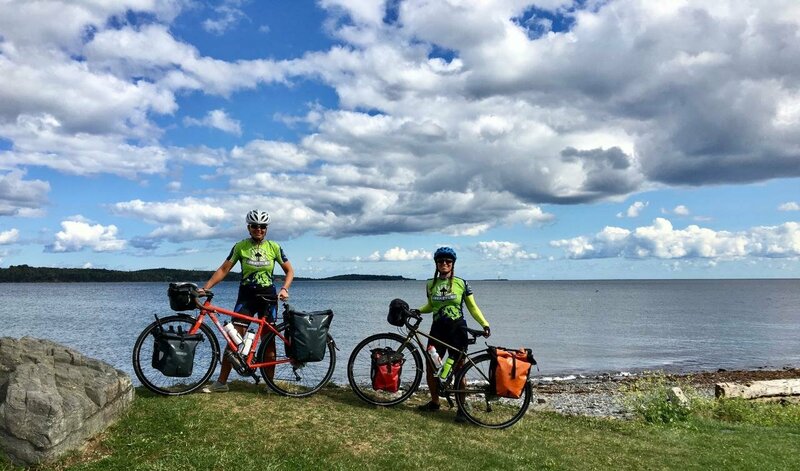 A little more than an hour later, we were in Nova Scotia, with Alana waiting for us in her orange Pictou County Cycles kit. She and Irena hadn’t seen each other in years since when they last both lived in Victoria. 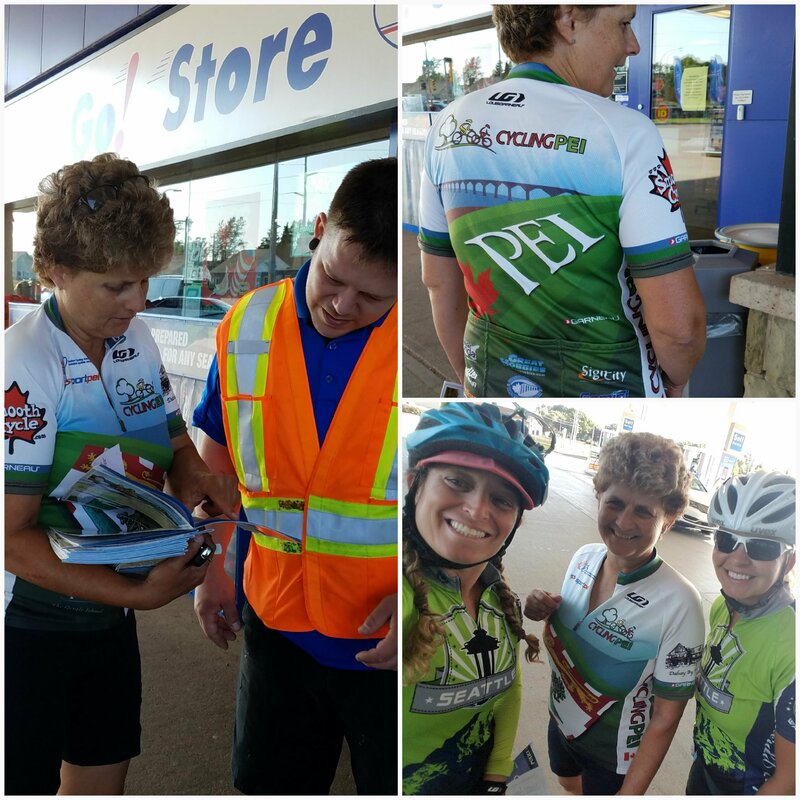 She was our photographer for the momentous provincial sign. Number NINE! 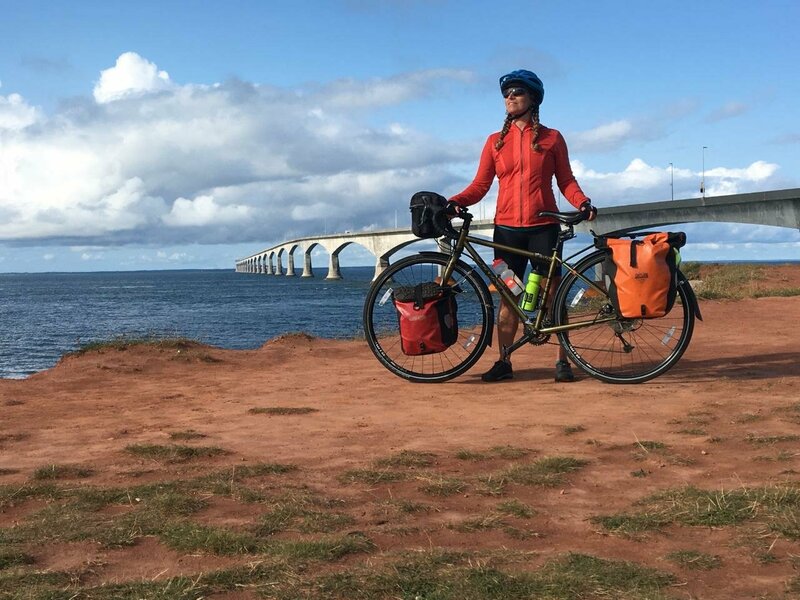 We have cycled to NINE provinces, and this is my last. We followed Alanna out the ferry road to the round about, and continued on paved and dirt roads to her farm house home, in rural unincorporated Pictou County, all the while hearing stories of the local dairy, the family farms, and the community she has returned to for work in as a home health nurse. Sipping beers and munching sugar snap peas right from her garden as the sun set behind the 80 acre property was another win of the day. The length of day is getting shorter. But the adventures are so varied, and the days so full, I need to divide it into parts. We returned to Gateway Village for breakfast, a photo shoot, and a meandering mornign to discover the best views of the bridge. That bridge! Really, a magnificant feat of engineering and more. Thanks Sue N, for your surveyor work on the project! II: The ride, the rain! It was only 30 miles, but after yesterday’s headwind and hills, it felt surprisingly tough. 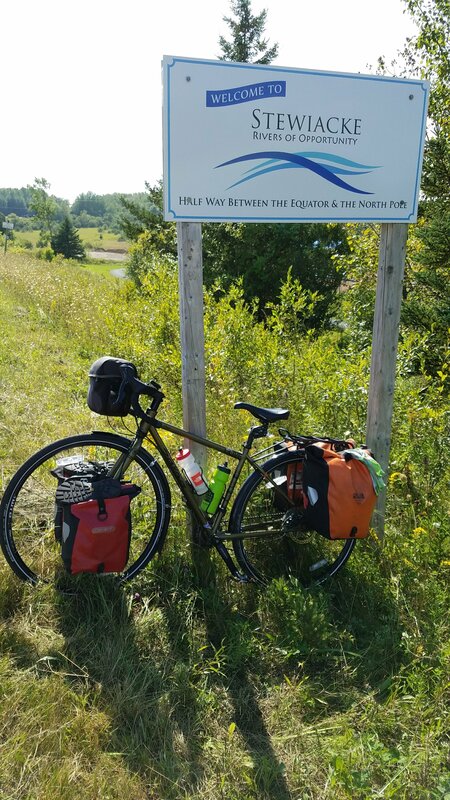 Plus we left the rail way grade of the Confederation Trail to cross to the north side of PEI. “There, towards the rain,” Irena navigated with a pointed finger. Jackets had already come on and off again thrice, plus sunblock. So what would it be? Sure enough, a deluge. It was amazing how fast we were soaked all. the. way. through. Faster than I could look around for any open barns or rooflines. 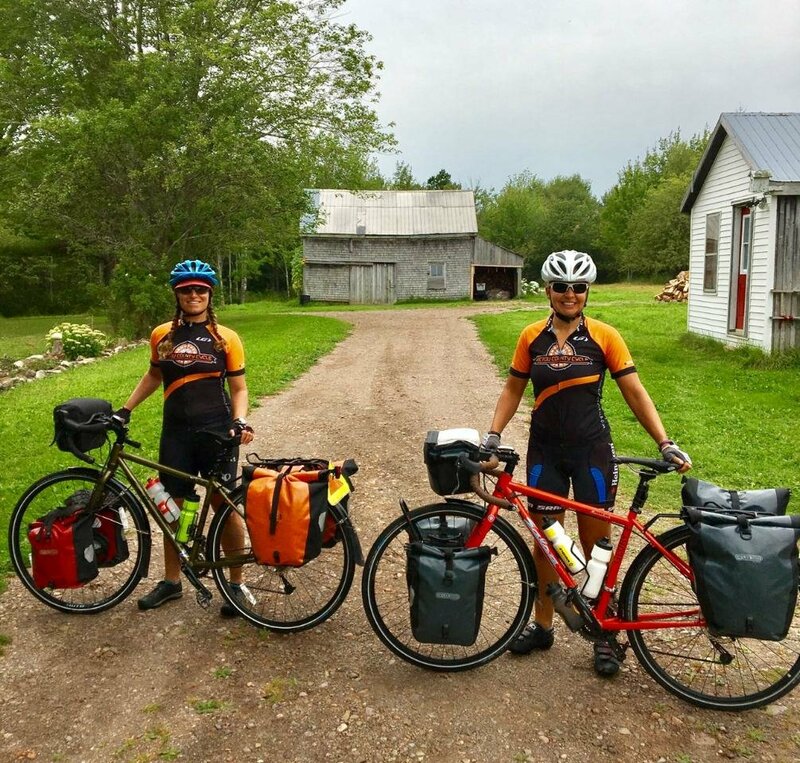 Shelter, by then, was moot, and I kept on riding into Cavendish. “The trees are my familiar friends” in the Haunted Wood and Balsam Hollow near Lovers Lane, and the way the waves say hello. 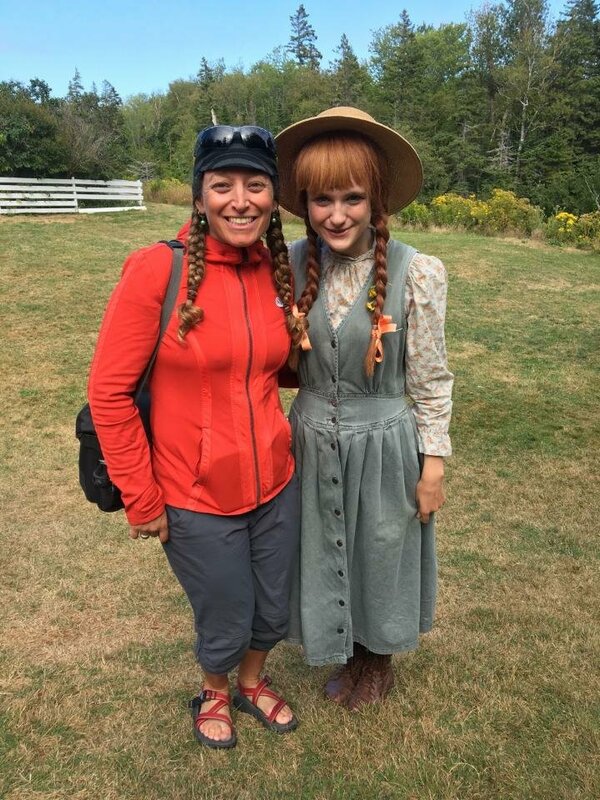 L.M Montgomery set Anne of Green Gables on her beloved PEI. We took a walk through the hertiage site, the woods, and stopped in to join the Sunday Picnic to get a photo with the fabeled friend. 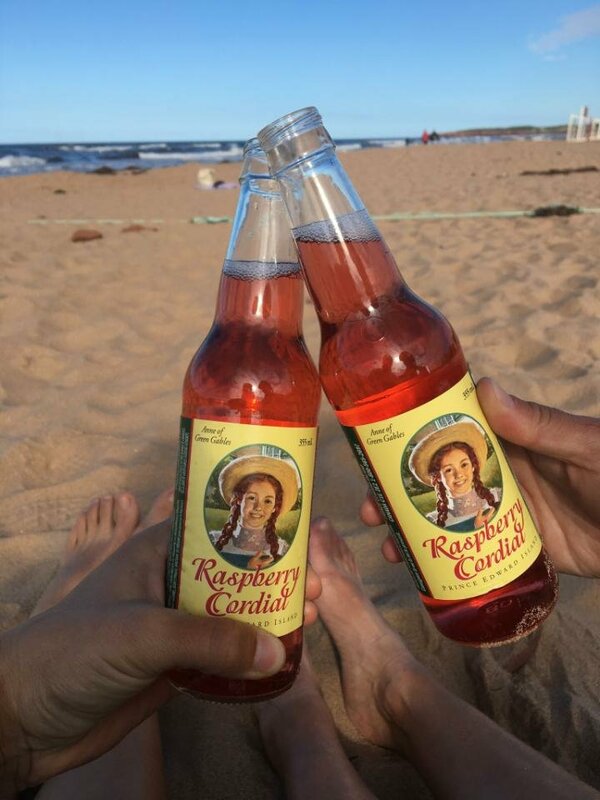 and later drank our Raspberry Coridials on the beach. At the boardwalk touristy spot we dried off and had lobster rolls for lunch, Irena’s first. 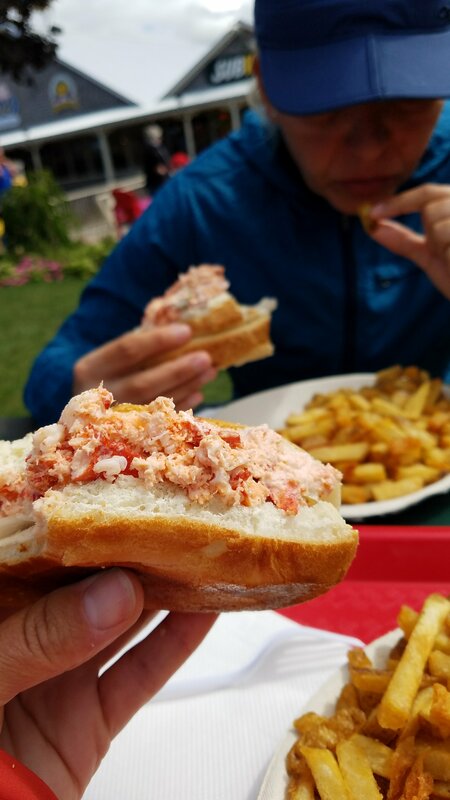 They are different than the Boston area lobsta rolls, in that here on PEI the lobster is tossed lightly with mayo and celery and served in the bun cold. 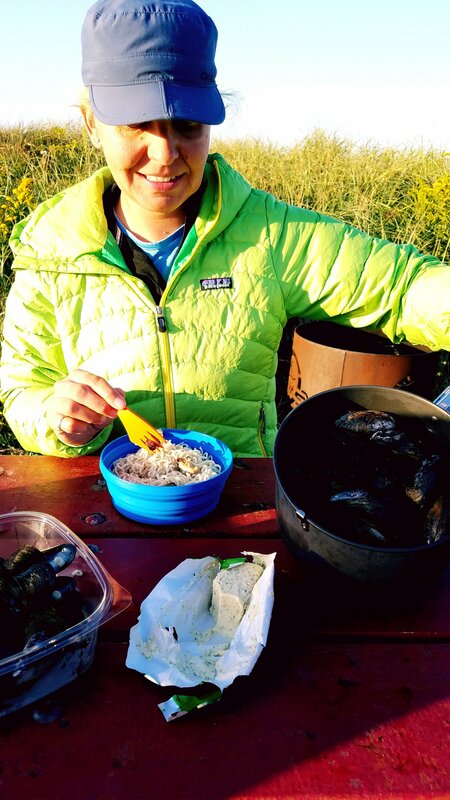 We rallied to cook a campground dinner of PEI mussles (the 2 pound bag fit into our pot!) with garlic butter, lemon, pasta, and beers. Dessert–jiffy pop, just because. I swam in the Gulf of St. Lawrence. The briney plunge a ritual, the ceremonial dipping of the curls, a mineral film on drying skin thanks to the evaporative power of the returned sun. 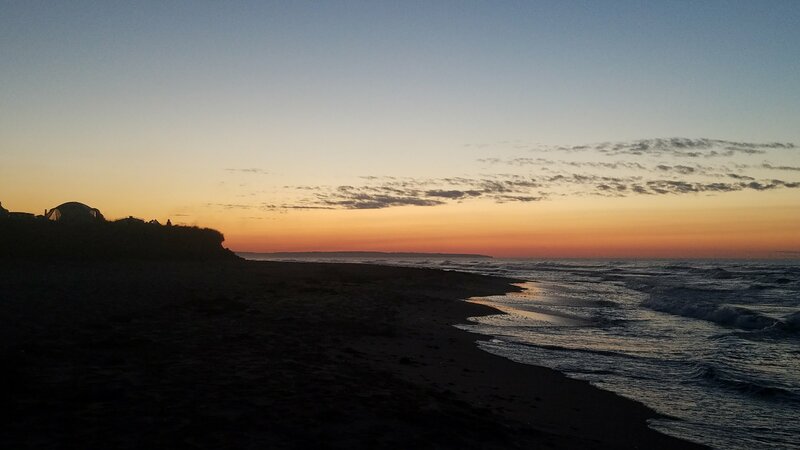 A sunset over eastern salt water. Bold stars, and the sound of surf lulling us to sleep.